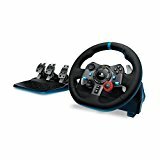 Logitech G29 Driving Force Rac.. Product weight is 4.96 lbs. The definitive sim racing wheel for PlayStation 4 and PlayStation 3: Realistic steering and pedal action for the latest racing titles Built to last: Durable solid steel ball bearings, stainless steel shifter and pedals and hand-stitched leather wheel grip Dual-motor force feedback: Realistically simulates the racing experience with smooth, quiet helical gearing Easy-access game controls: On-wheel D-pad, console buttons, paddle shifters and LED indicator lights. Responsive floor pedal unit: Accelerate, brake and change gears with the feel of an actual car. Platform compatibility : PlayStation 4 / PlayStation 3 and games that support Logitech force feedback racing wheel , OR Windows 8, 8.1, or Windows 7, 150 MB of available hard disk space, USB port, games that support Logitech force feedback racing wheel The definitive sim racing wheel for PlayStation 4 and PlayStation 3. Driving Force is designed for the latest racing game titles for your PlayStation 4 or PlayStation 3 console. 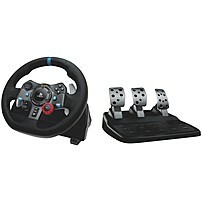 Add Driving Force to your controller selection and you may never want to race with a regular controller again. With dual-motor force feedback, on-wheel controls and responsive pedals, G29 makes racing feel like the real deal.